The availability of long distance transmission systems can help smooth out variations in availability of wind power, but helps solar less. Policy needs to enable long-distance links to allow continuing increases in wind generation. One of the challenges of moving to an electricity system running with a large proportion of wind and solar is that electricity output from these sources is variable, because the wind does not always blow and the sun does not always shine at any particular location. With small proportions of these sources on the system this is not much of a problem. However as a system becomes more dependent on these variable renewables, production is potentially curtailed in periods of high output, while there is a shortage of power at other times. I’ll refer in this post to wind and solar photovoltaic (PV) power, which is by far the predominant form of solar electricity. The issues with concentrated solar thermal power are different because there is some potential for storage in the power plant. Difficulties with balancing supply and demand typically begin to become more severe as each type of variable renewable power, for example wind, begins to supply more than (very roughly) around 15% of annual electricity. In practice the extent of the challenge of integration depends on a range of factors. One influence is the amount of inflexible generating capacity such as nuclear on the system. Another influence is the correlation between variable supply and demand. For example, there is some seasonal correlation between electricity demand and wind output in Europe (in winter demand is higher and it’s windier), and there is some daily correlation between electricity demand and solar PV output in Australia (the demand peak is in the daytime). Nevertheless, in any case there will be challenges in reliably meeting demand while accommodating very large amounts of variable supply. To address this problem variable supply can be moved to different times, using storage, and to different places via transmission capacity. Demand management can help, especially for a demand peaks, and some thermal back-up capacity is likely to be needed anyway in most cases. Typically, correlations of output across regions for solar PV are much higher than for wind, especially as distances increase (see chart). This is because solar output tends to depend strongly on time of day and season, which is quite similar even across an area as large as Western Europe, whereas wind varies with weather systems, which are less strongly related over distance of the order of 1000 miles or so. 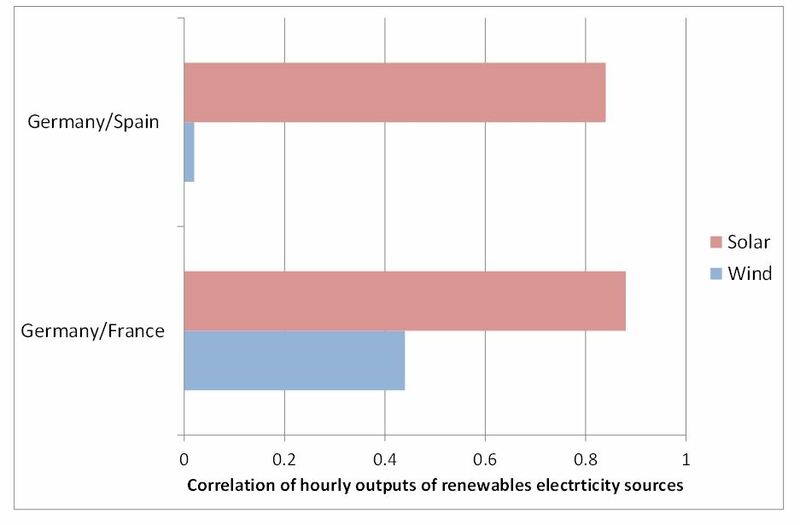 Looking at the correlations between hourly output in different countries in Western Europe shows that the correlation between solar output in Germany and France is 88%, much greater than for wind at 44%. Moving further away, the correlation between output in Germany and Spain is close to zero for wind, but still as high as 84% for solar. The match of solar output is is actually greater than these figures imply due to the large number of times when solar output is zero for both countries. Incidentally, the correlation between solar and wind output is negative (when it’s windy it tends to be less sunny and vice versa), so having some of each on the system tends to increase the combined total that can be accommodated, compared with a system only having either one or the other. A recent study of the USA by the National Oceanic and Atmospheric Administration (NOAA) confirmed very large benefits from High Voltage Direct Current (HVDC) long distance transmission for systems with large amounts of variable renewables. The study used very detailed weather and load data, and data on existing power plants. It concluded that with optimistic projections of wind and solar costs it is possible to reduce CO2 emissions by 82% with somewhat lower electricity costs, provided sufficient transmission capacity is in place. The study emphasised the importance of the transmission network encompassing a large geographical area, such as the 48 contiguous US states, due to the large geographical scales over which weather is variable. However, interconnectors are not always quick, cheap or easy to build. They often link or cross different jurisdictions – US States, Chinese provinces or European countries – and will often link different types of electricity trading arrangement. This can impose substantial barriers around permitting, and also around operation. Policy can help the growth of wind by reducing these barriers and recognising the growing role of internconnection, although the precise policy measures necessary will be quite locally specific. Enabling increased transmission is likely to be an important step in enabling the continuing growth of wind power in particular, and is likely to become increasingly urgent as growth continues. Thanks to Mathieu Ecoifier for providing the correlation coefficients between wind and solar in Europe. Correlation coefficients are a rough and ready indicator of independence. Actual effects on system operation will depend on many factors. This entry was posted in Climate change policy, power generation, renewables and tagged power generation, renewables on 16/09/2014 by adamwhitmore. Looking at past changes in each driver of total emissions emphasises the necessity of deploying very low carbon technologies. This applies to energy, the largest source of man-made greenhouse gas emissions, but it’s not a useful tool for looking other sources of emissions such as deforestation, industrial process emissions, and other greenhouse gases. Emissions from energy use have continued to grow to date because the growth in the first two factors in the identity has been greater than reduction in the last two. 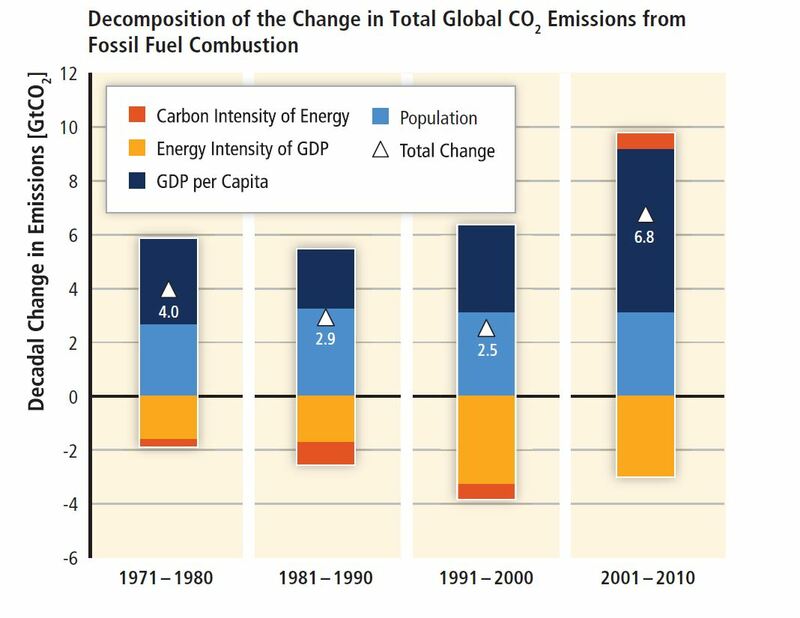 The chart below shows the breakdown into the four factors of the change each decade in total global CO2 emissions from fossil fuel combustion. Changes are measured in absolute terms – gigatonnes (Gt) of CO2 emissions per decade – rather than percentages. The bar segments show the changes associated with each factor alone, holding the other factors constant. Total changes, the net effect of the four factors, are marked by a triangle. In each decade population has grown, as has income per capita. This has been partially offset by a reduction in energy intensity. The smallest effect to date has been the change in the carbon intensity of energy use. There was a slight reduction in the emissions intensity of energy supply for three decades, reflecting in large part the growth of gas use, which has lower emissions per unit of energy than other fossil fuels, and, for part of the period, growth in electricity generation from nuclear. However this trend reversed in the first decade of this century, mainly due to the growth of coal use in China. This reversal, together with the larger effect of very strong per capita GDP growth and continuing population growth, resulted in an acceleration of the growth of emissions after the turn of the century. Globally, population will continue to grow in the coming decades, as will income per head, with the world economy likely to roughly triple in size by 2050 . If historic trends continue then falls in energy intensity energy will balance some of this growth of GDP, resulting in total energy use growing by about 70% over the period to 2050. There is doubtless more that can be done to reduce energy intensity, but even doubling this rate from its past level, which would be an extraordinary achievement, would only approximately stabilise energy use, and thus emissions if there is no change in carbon intensity. However carbon intensity of energy use is currently almost unchanged from its level a quarter of a century ago. 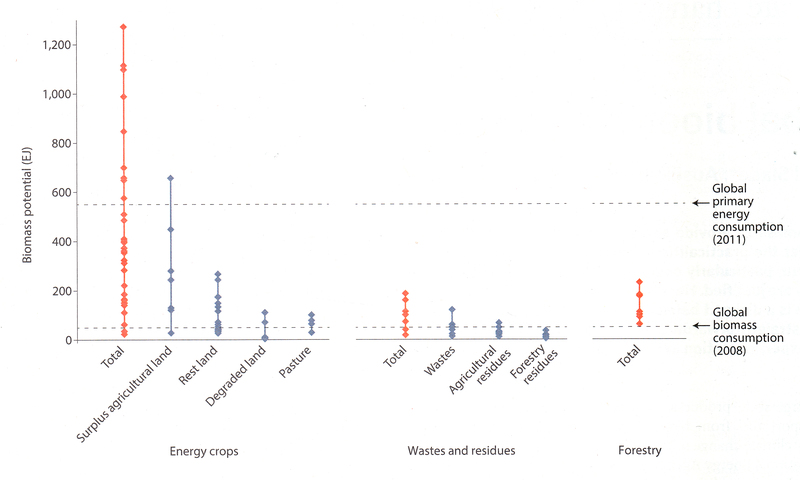 Of the four factors driving emissions this has had by far the least effect – the net effect of the red bars in the above chart is much smaller than the other three factors. If emissions are to be reduced, this factor needs to become as large as, or larger than, the other three factors. A transformation of the energy system towards much lower carbon intensity really is necessary. In this respect the falling cost of renewables, especially solar, and progress in delivering batteries with improved technology and lower costs represent some of the most encouraging developments in securing a low carbon economy that we have yet seen. Those who point out the urgency of the transformation to low carbon energy systems are right. Those who point out the difficulty of achieving the huge required trend break in carbon intensity are also right. The combination of urgency and scale of required reductions in carbon intensity, along with the need for faster improvements in the efficiency of energy use, is, at its simplest, what makes the problem of reducing emissions from the energy sector so challenging. Income is converted into common units using purchasing power parity (PPP) exchange rates. With no change in energy intensity, energy use would also triple. However, energy intensity has historically reduced at about 1.5% p.a. (based on World Bank data – other sources give broadly similar figures). This would reduce growth in energy demand to around 70%. Doubling the rate of energy intensity reduction to 3.0%, a huge increase, would only succeed in reducing the growth rate of emissions to around zero, thus stabilising emissions at their current level. Any reductions in emissions would still need to come from changes in carbon intensity. This entry was posted in Climate change policy, energy efficiency and tagged climate change, climate change policy, decarbonisation, energy efficiency, renewables on 27/06/2014 by adamwhitmore. The EU’s recently announced greenhouse gas emissions target for 2030 looks like just enough to keep the 2050 target credible, but seems unlikely to be perceived as highly ambitious by other jurisdictions. The European Commission has recently proposed a target of reducing EU greenhouse gas emissions to 40% below 1990 levels by 2030. Sectors covered by the EUETS (power generation and large industry) will be required to reduce emissions to 42% below 1990 levels. This post takes a look, using some rough-and-ready analysis, at how onerous the EUETS target would be if implemented. The Commission also announced a proposal to establish a “market stability reserve” for the EUETS. I will return to this proposal in a future post, but for now the analysis excludes its effect. The analysis also excludes the temporary delay of allowances sales over the next few years (backloading), which does not affect cumulative totals to 2030 in the absence of the stability reserve. A target of a 40% reduction by 2030 is on a straight line track from the 20% mandated by 2020 towards the least stringent end of the 2050 target, which is an 80-95% reduction from 1990 levels. This appears to be the minimum reduction likely to retain the credibility of the 2050 target, especially given the current surplus of allowances in the EUETS. A smaller reduction by 2030, requiring deeper cuts to be achieved more rapidly towards 2050, would likely have increased the perceived probability that the 2050 targets would not be adhered to. There is currently a surplus of EU allowances of around 2.2 billion tonnes, equivalent to about one full year of emissions covered by the scheme. This scale of surplus has arisen mainly due to the severity of the recession in Europe. Emissions currently remain below the cap, and even as the cap tightens it will take more than a decade for the surplus to disappear. This is illustrated in the chart below. The cumulative cap on emissions between now and 2030 (green line) starts at level of the current surplus. It then increases, but less rapidly each year as the annual cap comes down. This is compared with the illustrative case of annual emissions are constant at 2012 levels (solid blue line), so cumulative emissions grow linearly. In this case, with no reduction in annual emissions, the surplus disappears in around 2026. 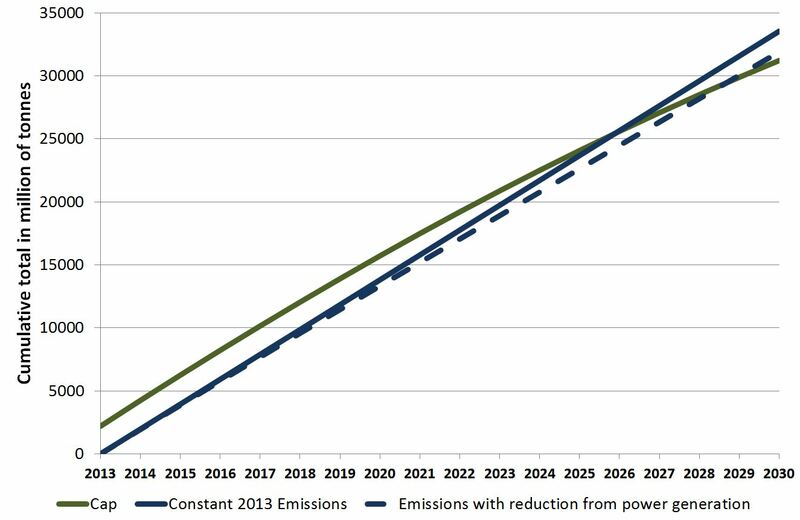 However in practice power sector emissions are expected to fall over the period (see below), reducing cumulative emissions (dashed blue line). This leads to the surplus disappearing only in 2029, and reduces the cumulative shortfall by 2030 to quite low levels, assuming emissions from industry are constant. Aviation is excluded from these totals. Although internal flights remain covered by the EUETS, the associated cap remains unclear. The power sector is the largest source of emissions covered by the EUETS, so is crucial to demand for allowances. There may be some increase in electricity demand over the period, and hence in demand for allowances. The increase may be smaller with strong efficiency measures, or larger if there is very rapid uptake of electric vehicles, and will also vary more generally with GDP growth over the period. There is also likely to be a decrease in nuclear generation to 2030 as older plant comes to the end of its working life and is not replaced by an equal amount of new plant. However the growth in demand and fall in nuclear output seem likely to be more than offset by continuing growth in generation from renewables. This implies a net decrease in the need for fossil generation, leading to lower emissions in the absence of changes to the fossil fuel mix. However there may be some increase in emissions from internal EU aviation, although any increase is likely to be much smaller in absolute terms than the decrease from the power sector. Trends in emissions from industry, assumed to stay constant here, will also affect the total. Any substantial scarcity that does emerge seems likely to be as a result of banking of allowances into the period after 2030, either as a result of private sector banking or the operation of the market stability reserve, which effectively mandates a certain amount of banking of any large surplus. The EU’s apparent intention to (just about) keep on a track towards its 2050 targets is surely welcome. However the proposed 2030 target for the EUETS thus does not seem very demanding. It seems unlikely that such a cap will be to be taken by other countries as a sign of strong EU leadership on emissions reduction. It also seems unlikely that the EUETS alone will become effective at stimulating large scale investment in low carbon technologies over the next decade and a half. This risks endangering progress to reduce emissions after 2030. Additional policy instruments will likely be needed if the EU is to succeed in building the low carbon infrastructure needed to put itself on a path to largely decarbonising its economy by the middle of the century. The 40% target requires a 20% point reduction by 2030 from the already mandated 20% cut due by 2020. If this were followed by 40% points (40% down to 80%) over the subsequent two decades an 80% cut would be achieved by 2050. 20% of 1990 levels per decade thus takes the cap towards the top end of the 2050 target range of an 80-95% cut by 2050. 2012 emissions include the industrial emissions additionally covered in Phase 3. Emissions from large industry are assumed to remain constant over the period. The linear reduction factor is assumed to increase from 1.74% p.a. to 2.2% p.a. in 2021. The estimates of power sector trends are based on the IEA 2013 World Energy Outlook New Policies Scenario. This scenario shows demand growth in EU power generation of 0.4% p.a. over the period, leading to an additional 260TWh of generation by 2030 compared with 2011. It also shows a decline of 10% in nuclear, but his may include optimistic assumptions about new build. A decrease in nuclear generation of 20% (180 TWh p.a.) seems plausible, and I’ve used this estimate. This leads to potential additional demand from fossil generation of 440TWh (260TWh + 180TWh). The IEA estimates that generation from renewables, including hydro, will approximately double between 2011 and 2030, increasing by 730TWh p.a.. This leads to a net reduction in demand for fossil generation of around 290TWh (730TWh – 440TWh) by 2030. The estimate of the saving takes account of the profile of these trends, for example the more rapid fall-off in nuclear in the 2020s. Additional TWh of low carbon power are assumed to reduce emissions by 0.4t/MWh, equivalent to displacing mainly gas. The electricity sector projections take their base year as 2011 while the emissions data base year is 2012, but this is taken account of in the calculations. Internal aviation emissions are currently around 84 mtpa, but the position of aviation within the EU post-2020 is currently unclear. The calculations assume that international aviation is dealt with under a separate agreement through ICAO, or not at all. The calculations exclude any additional reductions if other jurisdictions take action. Any reductions in the cap due to international action may in any case be accompanied by increased use of offsets within the EU. This entry was posted in Climate change policy, emissions trading, power generation, renewables and tagged carbon pricing, emissions trading, emissions trading scheme, power generation, renewables on 14/02/2014 by adamwhitmore. Imported solar electricity looks likely to be cheaper than nuclear in the UK by the early 2020s when new nuclear is due to come on line. Solar and other imported renewables deserve a closer look as one means to decarbonising the UK power sector. The recently agreed Contract for Difference (CfD) for new nuclear power at Hinkley Point in the UK fixes the price of electricity at £92.5/MWh ($149/MWh) for 35 years, indexed to inflation. This is expensive compared with the average market electricity price in 2012 of £45/MWh ($73/MWh) (see the end of post for notes on data and calculations). It is also expensive abatement, at around £136/tCO2 ($217/tCO2) against a gas plant at current market electricity prices. This compares with the UK carbon price planned for 2020 (including the UK’s own carbon price support levy) of £30/tCO2 ($47/tCO2). The price for new nuclear compares more favourably with the prices for alternative sources of low carbon power in the UK at the moment. It is cheaper than the current going rates for offshore wind, solar and onshore wind in the UK (£155/MWh, 125/MWh and 100/MWh respectively). It is also lower than the cost of Carbon Capture and Storage (CCS), which is estimated at around £160/MWh at the moment (with an abatement cost of about £400-600/tCO2 avoided after taking account of the residual emission from power plants with CCS). However, solar electricity in Germany and Italy can be produced for around £90-95/MWh, close to the price of electricity from Hinkley, based on the Feed In Tariffs in the first half of this year for ground-mounted systems. (The Feed In Tariff in Germany has since been reduced to £83/MWh but it is not yet clear how much capacity will be built at this price). First, the cost of back-up capacity and system balancing increases the cost of solar compared with nuclear. There is some increase in system balancing costs. Together these are estimated to add £13/MWh to the cost of solar. Any offsetting adjustment for the system capacity effects of nuclear is excluded from this number (see notes). Second, nuclear and solar have very different patterns of output with correspondingly different values. Solar runs only in the daytime, with output higher in summer. Nuclear output is largely constant, typically running at full output almost all of the time. With present wholesale market price patterns in the UK the additional value of daytime power for solar outweighs the additional value for nuclear from supplying winter evenings when prices are highest, leading to a premium for the value of the solar production pattern on average over the year of 6/MWh. (This includes crediting the full value of winter peak hours to nuclear, which may to some extent double count the value of capacity if the above capacity premium is also included in the comparison.) However, price patterns may change in future for many reasons, for example because large amounts of solar generation may reduce daytime prices. Summer daytime prices in Germany already show some weakening due to the amount of solar on the system, although they remain generally above overnight prices. Finally the length of the contracts also differs. The solar Feed In Tariff in Germany runs for 20 years whereas the Hinkley contract is for 35 years, inflation indexed in both cases, making the Hinkley contract more valuable. The additional value is estimated as £7/MWh or more (this is the additional price that might be needed if the Hinkley contract were to run for only 20 years). The adjustments thus offset each other (with, coincidentally, no net effect) leaving the costs of UK nuclear appearing very similar to the present costs of solar in Italy and Germany. In addition of course transmission costs to the UK would need to be paid for imports of solar from continental Europe. But it is more appropriate to compare the price of the nuclear contract with the price that solar – which can be installed very quickly – will require when the nuclear plant comes on line a decade from now (assuming it is completed on schedule). Solar costs look almost certain to fall over this period. Prices for solar in Germany are roughly a quarter of what they were a decade ago and are expected to fall significantly again over the next decade. Imports to the UK from sunnier regions in southern Europe, such as Italy or (especially) southern Spain could be cheaper still. It is impossible to be certain how far costs will fall, but a mid-range estimate (based on long term historical trends) is that prices of perhaps as low as £50-60/MWh or less could be attained for imported solar delivered to the UK by the time Hinkley comes on line, even allowing for the costs of transmission. Solar would then have a clear cost advantage over nuclear. Even new solar in the UK appears likely to be available at below the cost of power from Hinkley by then. Solar alone will not be a complete solution to decarbonising the UK power sector. But there are also other options for importing renewable power to the UK, including onshore wind from Ireland and Scandinavian hydro, which can provide considerable flexibility. While they may lack some of the employment and industrial policy attractions of building capacity within the UK, imports can allow access to a scale of renewable electricity supply that the UK, with its poor solar resource and (at least in England) exceptionally high population density, may otherwise struggle to reach. There are also other advantages to importing renewables. A diversity of locations, with varying demand and production patterns linked by adequate transmission capacity, can help balance the system, and ensure that power is available at lowest cost. Policy has an important role to play in making such imports of power viable. Policy can enable and incentivise the construction of transmission capacity, more flexible system design and operation, and appropriate commercial arrangements. The Hinkley nuclear deal signals that the UK Government is serious about meeting the need for new low carbon power. The CfD mechanism provides a new way to finance new nuclear power, and it makes the costs of the project transparent. And the UK may turn out to need new nuclear plant if it is going to meet its ambitious decarbonisation objectives (although likely of a different desgin). But options for importing renewable power do not as yet appear to have received the same degree of policy focus as new nuclear. Imports of renewables may have a significant role to play in diversifying supply and limiting the total costs of providing low carbon power. They deserve much more serious and ambitious attention than they have yet received. No adjustment is made for any of the other features of the contract. In particular no adjustment is made for the value of the loan guarantees for which the project is reported to qualify. The price for CCS is taken from the report of the UK’s CCS cost reduction task force. There is an aspiration to reduce costs of CCS to around £100/MWh by the 2020s, but it is not clear whether such a large reduction can be achieved given the slow progress in developing CCS in the power sector globally. There are similar aspirations to reduce the cost of offshore wind. Calculations of abatement cost are based on a comparison with emissions from a CCGT of 0.35 tonnes/MWh, using the current market price of electricity, with emissions from plant with CCS at 0.07 – 0.15 tonnes/MWh depending on fuel type and capture rates. The cost of solar in Germany used is the 2013 feed-in tariff for ground mounted systems less than 10MW of 11.02€c/kWh in April 2013. The feed-in tariff in Italy was at a similar level. The estimated cost of back-up capacity is based on a study from the solar parity project. http://www.pvparity.eu/fileadmin/PVPARITY_docs/public/PV_PARITY_D44_Grid_integration_cost_of_PV_-_Final_300913.pdf The calculation ignores the cost of system capacity associated with nuclear that arises because the proportion of total capacity it accounts for is lower than its proportion of energy it accounts for. This leads to an additional capacity cost associated with nuclear which to some extent offsets the additional capacity cost of solar, so the capacity cost of solar should in reality be estimated as the difference between the capacity costs of nuclear and solar rather than the full value quoted here, which would decrease the relative cost of solar. The price premium for solar is based on 2012 price patterns. The wholesale electricity spot price in Great Britain is weighted by solar output in Germany over 12 representative days (one per month), allowing for the one hour time difference between Germany and the UK to get the output pattern for notional imports (data was Italy or Spain would yield slightly different results, but the general pattern would be the same). This is compared with the time-weighted average over the year, which is assumed to be the price received by nuclear power. Peak prices during winter evenings contain an element of payment for capacity. This is added to the value of nuclear relative to solar in this calculation. However an element of capacity value has already been included as a separate item in the adjustment (see above). As noted in the main text, there is potentially an element of double counting here, with the value of capacity for nuclear being available at the peak included both in this and the capacity adjustment itself. This calculation combined with the capacity cost above may thus understate the present premium value of the solar output pattern, and so the assumption is somewhat favourable for nuclear. Adjustment for contract duration is based on comparison of cash flows from a 20 year and 35 year contract. The calculation assumes the 2012 baseload market prices prevail in real terms in years 21-35 of the contract (approximately 2044 – 2058), but adjusted to allow for a carbon price of £30/tCO2, based on the government’s stated price target for 2020. There is a stated goal of increasing the carbon price beyond this level, but the achievability of such a high carbon price remains unclear, and is not regarded as a base case for the purposes of this calculation. The calculation assumes 8% real terms discount rate (real, pre-tax). A further adjustment could be made to take account of the lower risk of the revenue stream from the fixed price contract, which would further increase the value of the longer term nuclear contract. Another study by the Solar Parity Project estimates a likely reduction in the cost of solar by 2023 of around 40%. Costs of solar power from southern Europe in 2013 can readily be estimated as anywhere between around £35-65/MWh or depending on rates of deployment, technology learning rates, how much of present low cost of panels is due to cyclically low prices, whether installation costs can match German levels, and what load factor is achievable. Corresponding costs for UK solar seem unlikely to be greater than around £80/MWh, although the UK government’s own estimate for 2020 is much higher, at around £100/MWh, for reasons which are unclear (see solar roadmap document https://www.gov.uk/government/publications/uk-solar-pv-strategy-part-1-roadmap-to-a-brighter-future). If solar gets cheap enough it is possible that the UK’s poor solar resource would be less of a problem considering cost only – the extra output in southern Europe might be offset by the extra transmission costs at very low cost levels. However this seems a distant prospect, and anyway land availability and the high population density in England would continue to favour imports. Exchange rates used are $1.61/£ and €1.19/£. This entry was posted in Climate change policy, power generation, renewables and tagged decarbonisation, power generation, renewables on 13/11/2013 by adamwhitmore.